Named for their colorful and eye-catching feathers, these birds are commonly known as the Blue Headed Pionus, or, more simply, the Blue Headed Parrot. Their scientific name is Pionus menstruus. 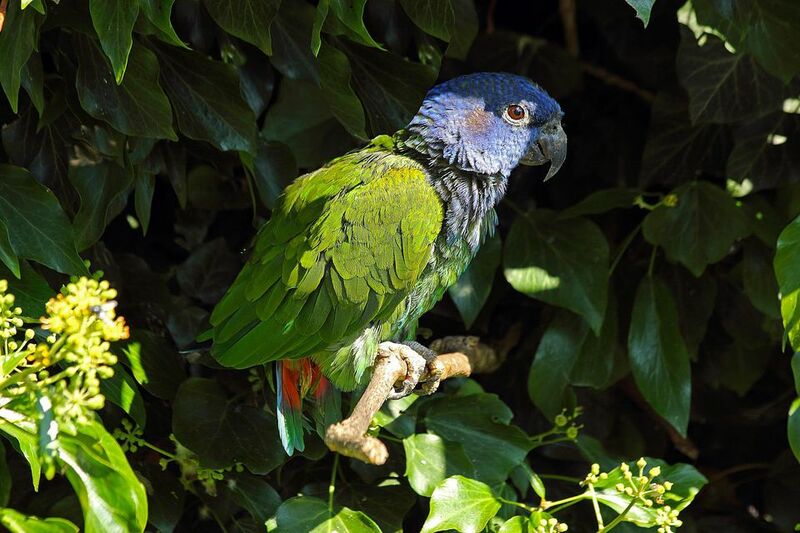 The wild Blue Headed Pionus makes its home in the tropical areas of Costa Rica, Central America, and South America, where it thrives in humid areas and nests in forest trees. It has been kept in captivity for many years, and this has led the Blue Headed Pionus to be beloved as a pet in homes all over the world. The Blue Headed Pionus is a medium to large sized parrot. At maturity, these types of birds typically reach lengths of up to 12 inches when measured from beak to tail. They are relatively stocky parrots, like other types of Pionus, and adults generally weigh in the neighborhood of 8 to 9 ounces when at a healthy weight. Like other Pionus species and most hookbills, a healthy, well taken care of Blue Headed Pionus can be expected to live up to 40 years in captivity -- and some have even been documented to live even longer. Due to their exceptionally long lifespan and the attention that is required when caring for a pet bird, potential owners are strongly cautioned to do plenty of research and make sure that they are ready to commit to caring for one of these birds before adopting one. The Blue Headed Pionus, like other Pionus parrots, has a reputation for being independent while at the same time remaining closely bonded and devoted to their owners. They enjoy interacting with their human family members, playing games, and amusing themselves with plenty of bird toys. Many owners have reported that they have easygoing, gentle personalities and that they tend to not bite as much as other species -- although they are certainly capable of doing so if they take an inclination. Pionus parrots are also widely reported to be among the quieter types of parrot species, especially for their size. The beautiful plumage of the Blue Headed Pionus is responsible for the bird's name as well as its immense popularity among pet owners. The body of these birds is mainly a bright green color, with bronze overtones on the upper parts of the wings. The head is a bright and brilliant blue color, and this continues to the mid part of the bird's breast. They have darker, dusty colored circles on each of their cheeks, and red feathers on the undersides of their tails, as all Pionus parrots do. Another distinctive feature of these birds is a characteristic red patch on the upper mandible of the beak. Like all parrots, ample attention should be paid to the nutritional content of the Blue Headed Pionus' diet. In captivity, these birds tend to do best when they are fed a high quality commercial pelleted diet, supplemented with a seed mix formulated for large birds. These foods should always be served in conjunction with a variety of fresh bird-safe fruits and vegetables to ensure that they are getting the proper amounts of vitamins. These parrots also normally enjoy a variety of homemade bird treats such as bird bread recipes, sprouts, and other nutritious creations. Pionus parrots are very active, and they need lots of room to play and exercise each day. That said, anyone who is interested in owning one of these birds should make sure that they have time in their schedules to give their pets 3 to 4 hours outside of the cage per day, at a minimum. This out of cage playtime should be strictly supervised and should occur in a bird-proof area as Pionus are very curious and could get into an accident if left to their own devices. Beautiful and loving, the Blue Headed Pionus has enjoyed great popularity as a pet for many years, and it seems that this trend is not in danger of diminishing. While they are charming, easygoing birds, it cannot be stressed enough that they are not the best pets for everybody. If you are thinking about adopting a Blue Headed Pionus, you should definitely do plenty of research to make sure that your lifestyle is suited to caring for one of these birds. Contact a local breeder or an aviculture society in your area and speak with people who have experience keeping and raising Blue Headed Pionus parrots. They will be able to guide you to the proper resources that will help you to decide if a Blue Headed Pionus is the right bird for you.